Something seems to be going on in the Boston Archdiocese that ought to be concerning to all Catholics (Boston-area and beyond), anyone who values freedom of speech, and Catholic bloggers across the country. Maybe it is all coincidence. You can decide for yourself. Things have been pretty predictable on this Catholic blog since we started it in June. Traffic has grown by leaps and bounds, but we started noticing something unusual for the first time late last week. Daytime traffic to the blog and visits from the Archdiocese of Boston in Braintree suddenly plummeted, and evening traffic from random ISPs suddenly picked up. It happened shortly after we published “Caritas Coincidences” which revealed an array of additional conflicts of interest and coincidental political contributions–all publicly available information–that would cause even more people to start questioning the deal to sell Caritas Christi to Cerberus. (That transaction is undergoing review by the Attorney General, and public participation–including offering input–has been invited by the state and is a protected right). By coincidence, at about the same time, we started getting reports from multiple sources and channels that the Archdiocese had blocked access to the Boston Catholic Insider blog from within the Pastoral Center. We published Caritas Coincidences: Part 2–with more information readily available to the general public–and got more confirmations that the site was being blocked. What exactly is going on? Here is what we can tell you beyond those reports. A number of local people go to 12:05pm Mass at the Pastoral Center, and coincidentally, the other day a faithful Catholic was there in Braintree for Mass and went on one of the public Internet terminals in the lobby to catch-up on the latest from Boston Catholic Insider. (We are flattered that the blog is daily reading for many people around the Archdioc ese and beyond). They got back a message from an Internet content filter saying the following: “Content blocked by your organization. 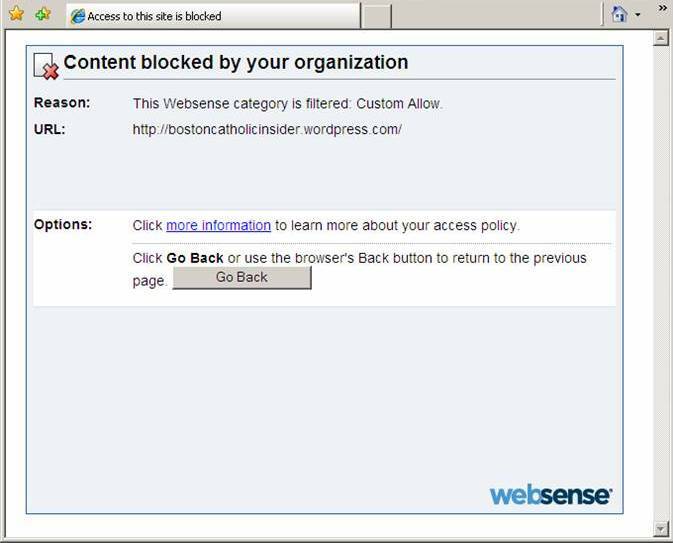 Reason: This Websense category is filtered.” They brought a friend back for Mass yesterday and by coincidence, when they were trying to get their daily fix of Boston Catholic Insider, they got the same message. Click on the picture to the right to see the message. We are just trying to help the Archdiocese achieve those same admirable goals. Our driving purpose with the blog in putting certain topics out in the light of day is simply to expose verifiable facts and matters that most people objectively feel should be addressed or corrected, so that we can build a stronger Catholic Church in Boston and continue the good works of the Church today and for the future. First and foremost, we hope this will make the difficult job and vocation of a Boston priest easier and more satisfying. (Several of them recently told us that the archdiocese is operating more like a poorly-run business with a church attached to it in recent years, rather than being the Catholic Church with salvation of souls, ministry and evangelization as the focus). We also hope this will make things better for loyal hard-working dedicated Pastoral Center employees who love the Church and are committed to the mission of the Church. We hope it will give donors more confidence and trust that the archdiocese is using their contributions most efficiently and effectively. More than 15,000 unique visitors have come to the site in the past two months from Boston, across North America, Europe, the Holy See and other parts of the world. About a third are repeat visitors. Surely there is something we are doing here that brings value in building the kingdom of God and has people coming back. The Holy Father has embraced blogging and use of new media to proclaim the Gospel. Cardinal Sean P. O’Malley was the first blogging cardinal and has responded to the Holy Father’s call with the new Catholic Media secretariat. Boston just hosted a Catholic new media conference that attracted 200 people according to the Pilot report. Annual financial reports are published for the archdiocese and various entities of the Corporation Sole to advance the goal of transparency. The Vicar General leads regular staff meetings at the Pastoral Center with public Q&A. (Even if the Chancellor is conspicuously absent from these meetings and the HR director avoids answering some of the pointed questions, it is still a positive sign of openness and transparency that the meetings take place). We would hope that the Archdiocese would encourage readership of the Boston Catholic Insider blog as a complement to Cardinal Sean’s blog, since we can cover topics perhaps the Cardinal does not find fit conveniently with his own blog strategy and coverage. We are not looking for a “seat at the table” as others have asked for in the past. We would hope that Chancellor McDonough, his staff and the Pastoral Center staff, and the archdiocesan finance council would welcome the blog as a source of information and insights that improve transparency and help identify sources of cost savings and conflicts of interest that risk breaching the public trust in the archdiocese and should be addressed. In the absence of an established whistleblower policy that protects priests and employees (recommended by many organizations these days, including archdiocesan auditors), it seems we have proven a useful outlet and vehicle for people who care about the future of the Catholic Church and Boston archdiocese. “any country which restricted free access to information risked “walling themselves off from the progress of the next century… A new information curtain is descending across much of the world,” she said, calling growing Internet curbs the modern equivalent of the Berlin Wall. We do not know what exactly is going on at 66 Brooks Drive. Is the publicly accessible information we have posted about the Caritas deal a problem for anyone? (We have emailed the same information with no responses so it would seem no one has objections, and the Attorney General has specifically invited input to a matter under consideration by a governing body in the state). Are the conflicts of interest we have documented in hiring key people–also publicly accessible to anyone–a problem? Are they worried not about the blog itself documenting publicly available information about excessive spending (e.g. six-figure salaries) but the comments that readers are posting? Is the mere prospect of archdiocesan employees reading this blog concerning to Boston’s archdiocesan leadership in a similar way that leaders of Communist China are concerned about Chinese citizens reading about the 1989 Tiananmen Square protests? Perhaps there is just some inadvertent IT error in the Internet filters at the archdiocese that got our blog in the same category as pornographic sites that would be legitimately blocked from archdiocesan filters–and this happened coincidentally right after the latest Caritas posts. Whether it was a directive from Chancellor Jim McDonough to block our site or it is an unintentional IT problem with the filter, we humbly request that the IT folks and Chancellor McDonough fix the problem and stop blocking the blog. It would be helpful if you could also assure workers in the archdiocese that “Big Brother” is not monitoring their web activity (or visits to this blog). Frankly, it seems word is spreading about the blog being blocked from Braintree, as our evening traffic, weekend traffic, and word-of-mouth referrals have gone through the roof. So, if the intent was to have fewer people read the blog, the opposite is happening. And please do not worry about trying to find and stop information “leaks” springing from 66 Brooks Drive. If you are looking for our primary sources of information, they are not there. Besides that, since many of us give our hard-earned money to support the archdiocese financially, instead of spending time and thousands of dollars in donor money on lawyers and IT people worrying about who is blogging and where they are getting information—a lot of which is just out there in the public domain or available from sources outside of the Pastoral Center—how about the archdiocese instead try welcoming the additional help with transparency we have been providing and focus on addressing the issues we have documented? In the absence of an established whistleblower policy, we could be one of best vehicles available to you to help strengthen the archdiocese, clean-up corruption and cronyism, identify ways to save money, improve morale across priests and other church/parish employees, and lay the foundation for being better able to spread the Gospel of Jesus Christ to the people in Boston. After we are unblocked, would it be too much to ask for a Boston Catholic Insider plug on the Cardinal’s blog and mention in an upcoming weekly archdiocean email blast? This entry was posted on Wednesday, August 18th, 2010 at 3:55 pm and is filed under Archdiocese of Boston, Archdiocese vs Bloggers. You can follow any responses to this entry through the RSS 2.0 feed. Both comments and pings are currently closed.